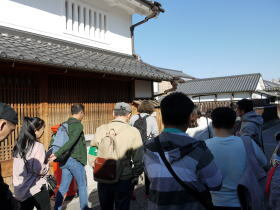 On November 3rd, 2018, the last Culture Day of the Heisei era, a refreshing clear autumn sky, which lasted all day, was just appropriate for our guide excursion tour. 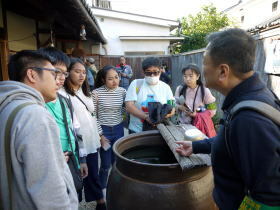 The special guiding tour for foreign visitors, following the one we had last autumn, was planned and offered by the Tondabayashi City Tourism Promotion Association. 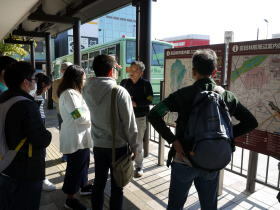 The seven participants who had applied for a prior reservation and the seven staff members gathered in front of the south exit of Tondabayashi station (Kintetsu Railways) at 9:50 a.m.. 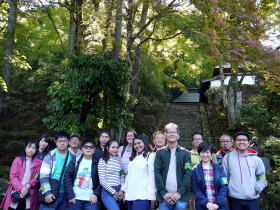 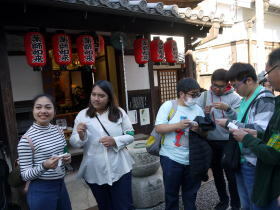 The participants included five foreign exchange students from Indonesia, who are studying at the Momoyama Gakuin University (Izumi City, Osaka Prefecture) and two Japanese, who are living in Osaka Prefecture. 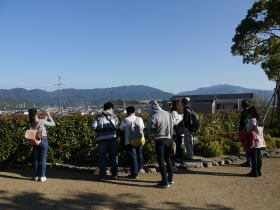 The foreign students applied for the tour because of a leaflet they found at the international center of their university. 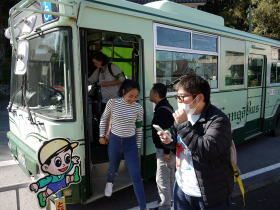 To reach our first destination we took the public transportation of ‚Kongo Bus’ from Tondabayashi station for ‚Nanpian Kannonji Buddhist Temple’ in the southeast of Tondabayashi City. 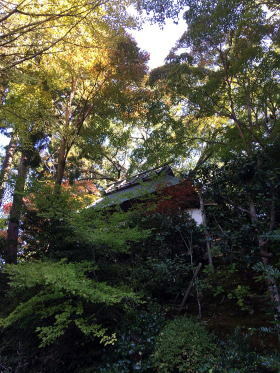 This temple is one of the old ruins related to the Kusunoki clan in the medieval period. 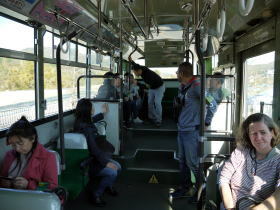 The ‚Kongo Bus’ has usually a lot of vacant seats on the not so populate routes, however on that day the seats were occupied. 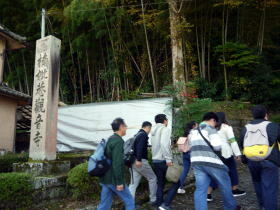 On both sides of the route the peaceful countryside scenery of the South-Kawachi region came into view. 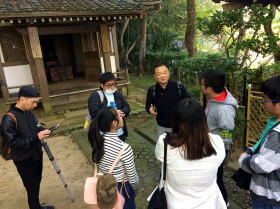 There were rice fields and cosmos flowers in full bloom. 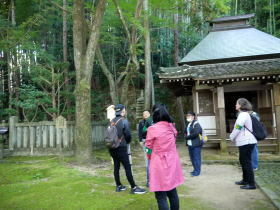 Getting off at Kannabi bus stop and climbing a little up a slope, we reached the main gate of Nanpian Kannonji Buddhist temple in a dense forest. 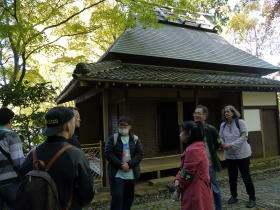 The wife of Kusunoki Masashige lived her later years building a small pavilion after his death and her cemetery remains here. 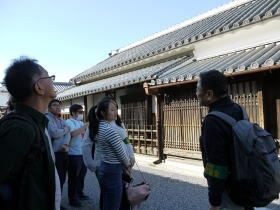 During the Taisho era (1912-1926), the existing buildings of Nanpian Kannonji temple including the Kannon Pavilion were rebuilt to commemorate his great achievements. 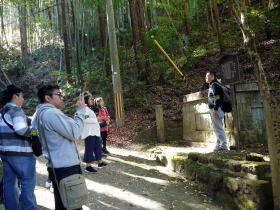 The clan of Kusunoki Masashige, who was called Great Nanko, ruled the south Kawachi region around the 13th century, so there still remain such ruins as mountain castles and battle fields in the southeastern part of Tondabayashi city and Chihaya-Akasaka village. 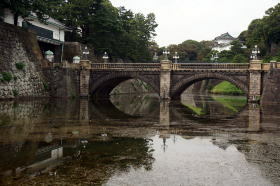 As for the fact that the clan of Kusunoki Masashige was loyal to the Emperor Godaigo, some episodes of Great Nanko had been taken up to the textbook of elementary and junior high schools before World War II and were sung as an elementary school song under the influence of militaristic education. 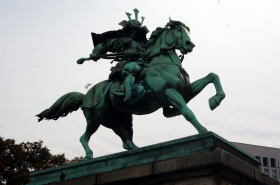 A bronze statue of Great Nanko riding a horse was made in 1891 and was placed towards the direction of Nijyu-Bashi bridge at the Imperial Palace in Tokyo. 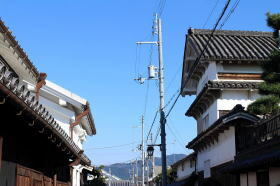 As a historical hero of the south Kawachi region, the ‚Nanko Street’ in Tondabayashi is named after the Great Nanko. 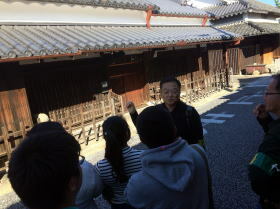 The social system and its education in Japan were drastically changed to the democratic system after the war, and the episodes of Great Nanko has no longer been told. 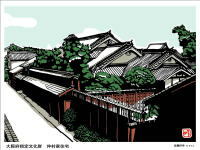 In such swell of history, Nanpian Kannonji temple shows a quiet appearance, praying for the repose of the souls of the Kusunoki clan. 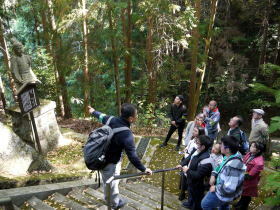 The precinct of the temple has mossed stone stairway and trees around the halls. 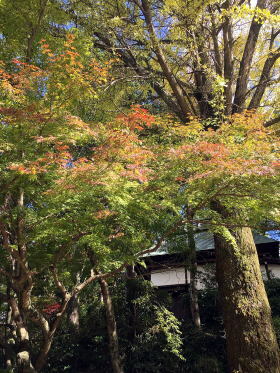 The green leaves have now started to change colors. 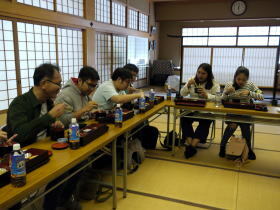 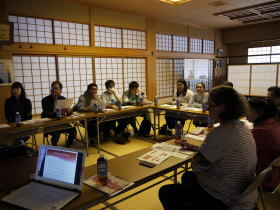 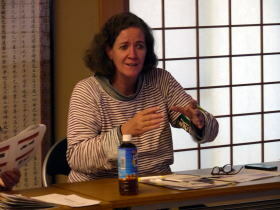 After the guide presentation we enjoyed catered food in the hall of Nanpi Kaikan for lunch. 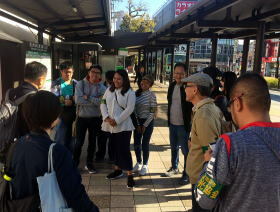 After lunch, the party came back to Tondabayashi station by bus and took a walk around the historic district of Tondabayashi’s tempeltown called ‚Jinaimachi’. 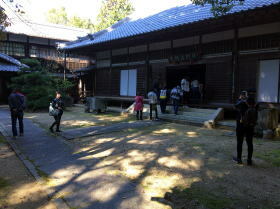 We dropped in at Yakushido Buddhist small pavilion where the statue of Yakushi Nyorai is enshrined. 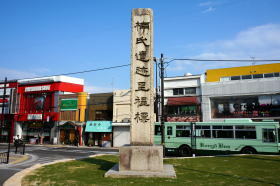 The statue is called Koibumi Yakushi and has a romantic legend. 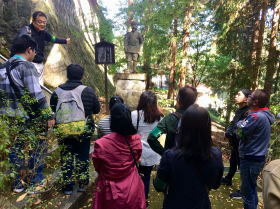 It is said to be made of plaster and papers of young men’s and women’s love letters, a long time ago. 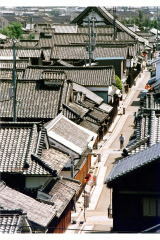 ‚Koibumi’ means ‚love letter’. 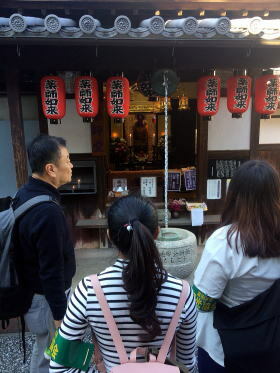 Omamori, a lucky charm and Omikuji, a fortune slip associated with the koibumi legend, are sold at that site. 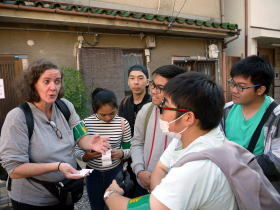 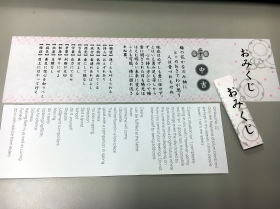 We had omikuji or fortune slips prepared for every participant, translated in English. 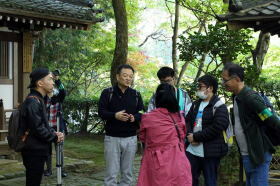 They stood still in front of Yakushido for a while, read the fortune of omikuji with English translation seriously and showed them to each other. 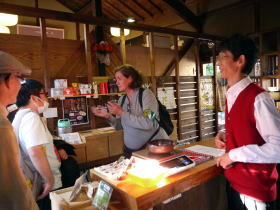 There was a great deal of excitement. 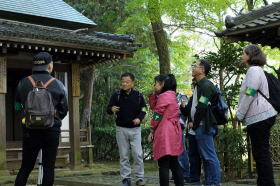 Walking to the Jinaimachi viewing terrace and enjoying the panoramic view of the Kongo Katsuragi mountains and Ishikawa river, we finished the guide tour. 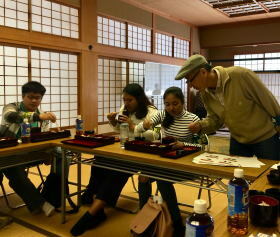 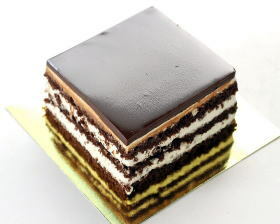 A cake present was also offered to each participant. 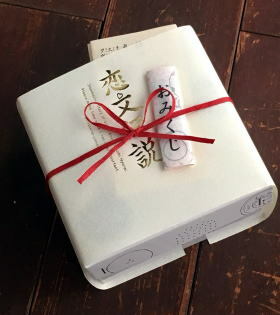 The cake is named ‚Crème Ganache‘ with the Koibumi Legend package, which is specially produced and sold by a local patisserie of the cake shop YAMAO in front of Tondabayashi station. 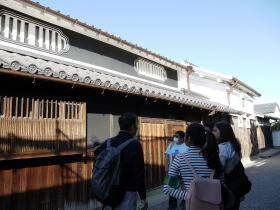 It is a good souvenir if you visit the historic district of Tondabayashi Jinaimachi. 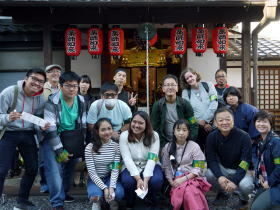 Thanks to a lot of people's support and cooperation, we finished the special tour guided tour without fail. 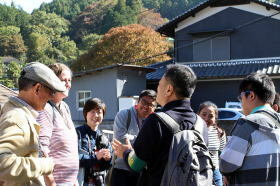 I think that everyone who participated enjoyed the rustic charm of Tondabayashi Jinaimachi Town, the beauty of the autumn and the taste of the autumn. 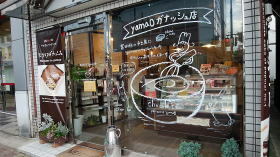 If you may have a chance, please visit Tondabayashi Jinaimachi Town again. 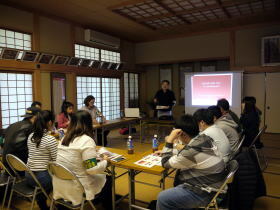 Thank you for your participation and cooperation. 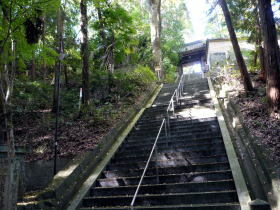 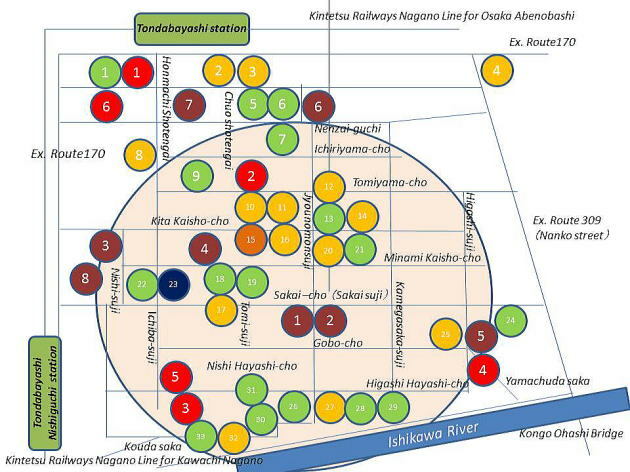 It is a 10-minute walk from Tondabayashi Staion or the Tondabayashi Nishiguchi Station of Kintetsu Nagano line. 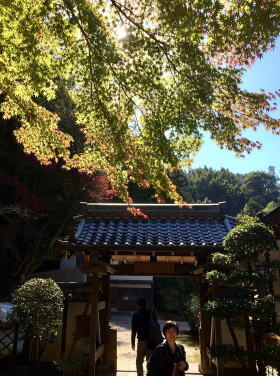 Koushouji Betsuin Temple is a temple of Jodo Shinshu School (Ikkoushuu School), which became the center of the development and establishment of Jinaimachi town in Tondabayashi . 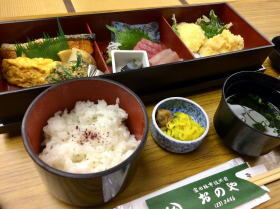 It has been popular as Mr. Gobo (Tondabayashi Gobo) among the local residents. 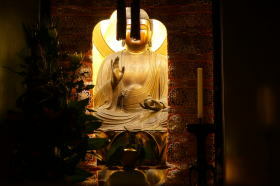 During the Ouei period (1394-1412years) , theincipient temple was opened in Ebitani village. 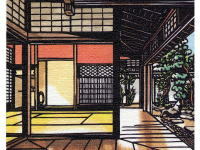 In 1560, Shoushuu Shonin, the 16th head priest of Koushouji Sect. 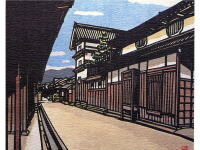 in Kyoto dismantled the building and reconstructedit to the present location, adjacent to Ebitani village. 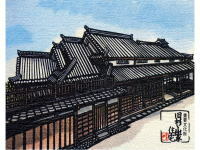 The temple gate looks toward the east and the Jyounomon-suji street. 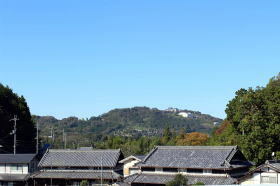 Those buildings such as the bell tower, the drum tower, the main hall, the reception hall and priest's quarters are set up and arranged. 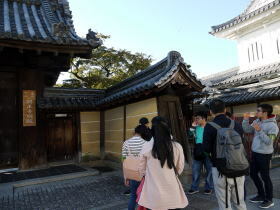 The main gate has refined style and it became clear in a recent investigation that the gate was further relocated from Koushouji temple in Kyoto, which was originally said to be dismantled and reconstructed from one of the gates at Fushimi castle in Kyoto. 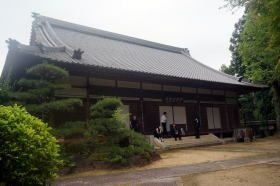 Koushouji Betsuin Temple was designated as an important cultural property of the country in 2014.